Hey friends...do you have wonderful plans for the Fourth? I will be with the grandsons enjoying their first fireworks...(I am sure there will be crying involved over the loud noises). How darling is this little cutie from Sassy Cheryl with her over sized pencil? (I just discovered this site and am super excited because ALL the images are so me ... woohoo!!) She is actually a digi so you can change the message she is writing for whatever may be appropriate for your card...Happy Birthday, Thanks, etc. 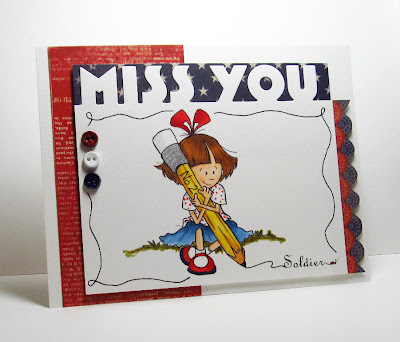 I am entering this card in the Operation Write Home Sketch Challenge #179 and Sassy Cheryl's Challenge. I colored her with Copics, die cut the sentiment edge Miss You by Die-Versions and used Authentique "Pride" for all the pattern papers. (and after taking the photo discovered the red paper is upside down....poopitz). This is cute as can be! I LOVE the word art across the top! your coloring rocks! Such a fun idea to change the pencil word on the bottom! Thanks for playing along in our Sassy Cheryl "Red, White and Blue" challenge this week! Poopitz? You are indeed a Sassy Gal. You fit right in here. It was love at first sight for me too when I discovered Sassy Cheryl. My first image was "Sassy Opinion" a girl sticking her tongue out at her mirror image. I knew I was hooked. Glad you discovered the site and hope to see you join in our challenges often. You are a very talented designer. Loved seeing your Beautiful creation this week. Thanks for joining us at Sassy Cheryls. This is a great card! So patriotic colored up in red, white, and blue. I love the way you changed the word at the bottom. Brilliant! Some solider is going to smile when they receive this card in the mail! Thanks for playing with us over at Sassy Cheryl's! Uber adorable. Love the miss you detail! WTG!! I'll be sending the day with friends and family, back home! Hope you have an amazing 4th. Now. . . . .let's get to your gorgeous card, Penny! I just LOVE the coloring and I ADORE that you put the word 'Soldiers' in there. That is just the PERFECT touch to your amazing card. 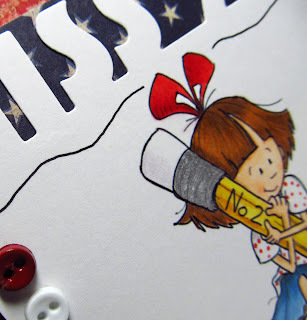 Thanks for playing along in the Red, White & Blue challenge this week with the Sassy gals this week. This is adorable! Love the image and the Miss You on top. Love that you made the image write Soldier and this is so well designed! Wonderfully done - LOVE IT! Hee he---poopitz, huh?! Well, if you hadn't said anything...I LOVE this card and love, too, that your little gal wrote "Soldier"-a perfect card for the 4th! I love it!